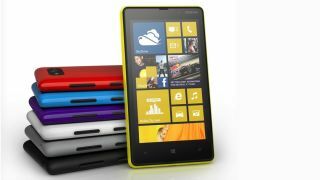 Wireless charging seems right on the verge of taking off, and Nokia may lead that "charge" (ha, ha) with the Lumia 920 and Lumia 820 Windows Phone 8 devices. Both phones were revealed in early September, and will be released on various carriers beginning in November. The Nokia Lumia 920 and 820 don't have built-in wireless charging, but require a charging shell and base to achieve the function. New details emerged on Thursday when Nokia announced pricing for the devices' wireless charging kits. The Nokia Lumia 920 and 820's charging shell resembles a standard phone case, and costs $32 (GB £19.99, AU $31). The charging shell appears to come in red, yellow, white, blue, and black, but aside from color differences there's only one type of shell. The wireless charging base is another story; it comes in three varieties. The plain, flat "plate" option is $88(GB £54.99, AU $86), while the "stand" - which stands the phone up while it's charging - is $112 (GB£69.99, AU $109). The luxury option is the wireless charging "Fatboy pillow," which provides a soft place for the Lumia 920 and 820 to rest and charge for $128 (GB £79.99, AU $125). Nokia's wireless charging accessories are available for pre-order now, though no formal release date has been announced, either in the U.K. or the U.S.
And the prices Nokia announced on Thursday apply to the U.K. only - prices in other countries could vary greatly. But either way, it seems wireless charging is about to catch on in a big way - LG's rumored Nexus smartphone, likely called the LG Nexus 4, has also been tipped for wireless charging capabilities.